AN investigation by The Detail has uncovered a disturbing variation in fire and rescue service response times across Northern Ireland. Fire crews based in some rural areas took an average of four times longer to reach emergency incidents in their area than their colleagues based in Belfast. We can also reveal that at least £62m was spent by the fire service in 2011 and 2012 responding in good faith to emergency calls which turned out to be false alarms – 1,396 of these incidents were malicious false alarms. Detailed data released in response to a Freedom of Information request shows that fire fighters based in three Belfast stations took an average of four minutes to respond to 999 call emergency incidents over the last two years – compared to an average of 18 minutes for Pomeroy and Newtownstewart crews. We calculated these averages by analysing information provided by the Northern Ireland Fire and Rescue Service (NIFRS) relating to the 51,669 call outs fire crews from Northern Ireland’s 67 fire stations attended during 2011 and 2012. The incidents include fires, road accidents, animal rescues and special service calls. Our interactive map below gives a breakdown of response times for each station. The data released to us by the NIFRS includes the name of the fire station which responded to each call, the response time, the address of the incident, the cause of fires and any injuries to members of the public and firefighters. The NIFRS has apologised to The Detail after admitting it originally removed some of the response time figures from the spreadsheets provided to us and had also applied a “cut off” to the remaining response time statistics. It was only after we challenged apparent disparities in these figures that the un-edited response time data was released to us in full. 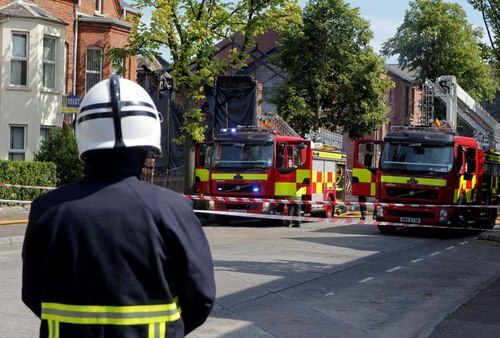 In the original data released to us, the longest wait for emergency help from the NIFRS was one incident listed with a response time of 29 minutes. However, the longest response time for an incident recorded in the new un-edited dataset was 1,400 minutes. We also now have response time data for 48,710 call outs instead of inaccurate data on 42,103 calls. Click here to read more details on how we secured this missing data. There was a high human cost. The incidents attended by crews over the two year period involved 168 fatalities and 4,974 people were listed in the data as rescued by fire fighters and/or hurt. A total of 75 incidents resulted in injuries to fire fighters. 23,775 (46%) of the emergency incidents attended were fires. Almost 69% of the fires were arson (1,605) or started deliberately (14,767). The term “arson” is used where the PSNI determines a criminal offence has been committed. The two longest waits for fire fighters were recorded as 1,397 minutes and 1,400 minutes but the NIFRS said it is “highly likely” the crews in these cases “omitted to transmit the appropriate status” to the control centre. 22,207 (43%) of the call outs attended were false alarms – 1,396 of these were malicious. With an average cost of £2,797 for one fire appliance to respond to an emergency call, false alarms cost the service a minimum of £62m over the two year period. Northern Ireland’s firefighters serve a population of 1.7m over an area totalling 5,500 square miles. There are 67 fire stations based in cities and larger towns manned by wholetime (full-time) or retained (part-time) fire fighters or a combination of the two. The part-time crew members are based in their own towns and go about their daily business until they receive an emergency call. They then make their way to the fire station and respond to the incident. Our analysis relates to the 51,669 incidents attended by Northern Ireland’s fire fighters during 2011 and 2012. 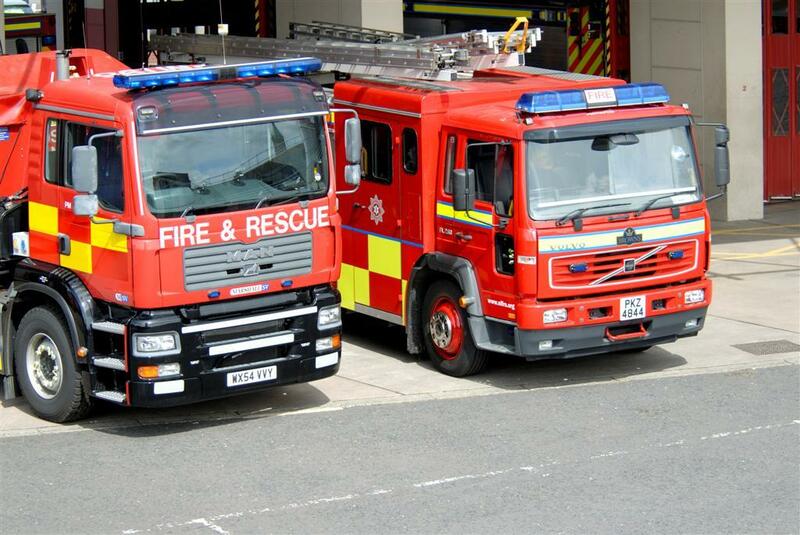 The NIFRS has confirmed it mobilised (attended) 63% of the total emergency calls they received in 2011 and 66% in 2012. Non-mobilisation can be for several reasons – for example multiple calls received about the same incident or because the regional control centre personnel were able to identify a hoax call. It costs on average £2,797 for each fire appliance to respond to an emergency incident. This cost includes fixed costs like heat, lighting, staff costs etc. In many cases, more than one appliance will attend. During our analysis of the data we noted some of the longest waits for fire crews to arrive. The NIFRS has provided a comment on each incident. See the link below this article on the reply to our questions to read the responses in full. In the majority of cases, the NIFRS contests its own official record of the longest response times. Among the longest waits recorded was a response time of 87 minutes by the Armagh crew to reach a man trapped underneath a forklift and fallen tree as a result of an accident on the estate of Lord Caledon in Caledon (Armagh) in August 2011. The man who worked on the estate died. The fire service said its detailed logs show that the first appliance was in attendance within 15 minutes. The reason for not booking in attendance correctly is “unknown”. In August 2012 the data we have shows it took 55 minutes for a crew to arrive at a major fire at Holywood Leisure Centre caused by an electrical fault. The NIFRS says the record should read as nine minutes. Again, the cause for this discrepancy in the records is “unknown”. In September 2012 the latest data we received showed that it took the Northland crew 32 minutes to reach a major fire in Derry. Two people were injured including one man who jumped from a window. A second man was treated for smoke inhalation. In the original data released by the fire service, the response time was incorrectly given as seven minutes. The NIFRS now says resources were on the scene within eight minutes. In February 2011, it took a crew 29 minutes to reach a major fire in the bedroom of a detached house in Leitrim, near Castlewellan, caused by an electrical appliance. The 999 call was made just before 1am. There were three casualties with smoke inhalation and a smoke alarm had alerted them to the fire. The NIFRS said that this call was attended by retained fire fighters from Newcastle and the incident was 8.5 miles from the station. In September 2012, the NIFRS’ records say that it took 25 minutes for the Newtownstewart crew to reach a fire in a detached bungalow in Plumbridge. There was no smoke alarm fitted in the house. There were two casualties including a man who received burns to his face and upper body. He was taken to hospital. The fire service’s explanation for the delay is to contradict its own figures by stating that the first appliance was actually there in 18 minutes. Road accidents and collisions also featured among the longer response time incidents. Lisnaskea fire crew took 29 minutes to reach a road traffic collision in Lisnaskea in July 2011. The 999 call was made at 2.23am. The NIFRS logs show that a man in his 20s was “heavily trapped”. He was removed using hydraulic gear and taken to hospital in an ambulance suffering from cuts and bruises. The NIFRS said that this “remote incident” was received second hand from ambulance control. Fire crews attended but had to re-contact ambulance control for further specific directions to the incident. The Fire Service’s own performance targets apply only to dwelling and property fires. In these cases, they aim to respond to fires in high risk areas within six minutes, in medium risk areas within 12 minutes and in low risk areas by 21 minutes. According to our calculations, these targets would apply to only around 6,330 (12%) of the total 51,669 incidents the service responded to during 2011 and 2012. The average response times at each station for these specific dwelling/property fire callouts range between one and four minutes. Only 22 fire stations attended fires – excluding road vehicles and outdoor fires – in high-risk areas. The NIFRS said that it monitors the response times to dwelling fires as this is where the main risk to life is but “in reality fire crews respond to all emergency calls with the same sense of urgency”. We did not restrict our analysis to only property fires. Instead we compared average response times achieved by each station for all call out types and, secondly, the average response times achieved for fires only. We included dwelling, other properties, outdoor and road vehicle fires. To put these in context, our interactive map also shows how many of these incidents occurred in each station area. Our key finding was that average response time for all call outs was four times higher in some stations than for the fastest responding stations based in Belfast. It took three Belfast stations – Whitla (Whitla Street), Central (Bankmore Street) and Westland (Cavehill Road) – an average of four minutes to arrive at the scene of any emergency incident. This lies in stark contrast with the average 18 minute response time for the Pomeroy and Newtownstewart crews. The average response time for all incident types was 10 minutes or more for 32 stations. Looking at only fire incidents, the number of stations with an average response time of 10 minutes or more increased to 35. Nine stations took an average of 15 minutes or longer to respond to fires. Omitting the two massive response times of around 1,400 minutes already mentioned, the next three longest response times recorded were 110 minutes (Omagh Station), 102 minutes (Pomeroy Station) and 93 minutes (Strabane Station). All of these were outdoor gorse fires in March and May 2012. Of the 67 stations, the 30 stations with the slowest average response times for all calls and all fire call outs were retained (part-time) crews. One was retained/variable. The NIFRS said that “due to their surrounding population densities some fire stations will be much busier than others”. The spokesman continued: "This is why we have a combination of wholetime/retained/variable crewed/wholetime and retained/volunteer fire stations to enable us to deliver an efficient and effective fire and rescue service for everyone in Northern Ireland. Take a look at our interactive map below to examine response times in your area. The busiest fire station over the two year period was Central in Belfast with 3,596 call outs over the two year period – an average of almost five a day. Meanwhile, the volunteers at Rathlin Island Station attended no incidents during 2011 or 2012. The next quietest station was Portaferry with 86 call outs over the two years. This is an average of one call attended every eight and a half days. The top 10 busiest fire stations were Central, Cadogan on Belfast’s Lisburn Road (3,127 call outs during 2011 and 2012), Springfield in west Belfast (2,982), Knock in east Belfast (2,673), Northland on Derry’s Northland Road (2,669), Westland (1,991), Crescent Link in Derry (1,692), Lisburn (1,691), Glengormley (1,639) and Newry (1,615). The NIFRS sent us a comment on Rathlin Station. “NIFRS has a statutory responsibility to ensure emergency fire and rescue service provision for everyone in Northern Ireland no matter where they live. Rathlin Island is no exception. “As there are a number of residents and businesses on the island, plus visitors, it is vital that NIFRS has a dedicated presence on the island to respond to fires and other emergency incidents. The provision of a volunteer station is suitable for this purpose. “Volunteer firefighters have attended incidents on Rathlin Island in the past and are prepared to respond to incidents in the future. An average of 70 call outs were attended each day by fire crews in Northern Ireland over the two year period. On 56 days, there were 100 call outs or more across the province. The day with the most call outs was May 2 2011 when 411 mobilised incidents were recorded by the fire service – 311 of these were outdoor fires including gorse and grass fires. The NIFRS said that late April/early May 2011 was an extremely busy time due to a spate of wildland fires. In one two week period, 1,977 gorse fires were tackled in total. Fire crews responded to a total of 23,775 fires from the beginning of 2011 until the end of 2012. 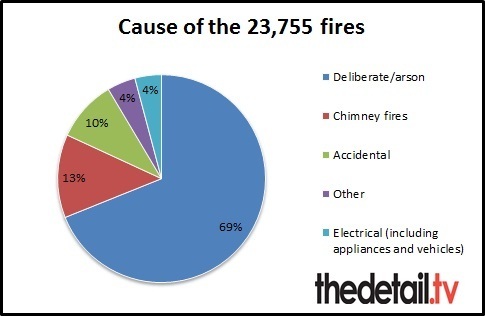 Our analysis of the detailed NIFRS data shows that the top causes of these fires were ‘deliberate’ (14,767), chimney fire (3,080), accidental (2,271), arson (1,605), electrical appliance (417), vehicle electrical (365), electrical (200), ‘cigarette etc’ (117), oil/chip pan (112), grill pans (87) and radiated heat (85). Other causes of note include 72 from an open fire, 36 caused by candles, 32 petrol bomb attacks on buildings or cars and nine fires were started by children with matches or a lighter. Of the deliberate fires, 12,597 were “outdoor”. They included wheelie bins, skips and grassland and 1,177 were at buildings/houses – including hundreds of derelict buildings. Over the two year period, there were a total of 4,018 gorse/grassland fires. Fire crews responded to 4,166 Special Service Calls (SSC). These are all types of rescue incident and included eight farm accidents, flooding incidents and road accidents. Among the farm accidents was the deaths of the three members of the Spence family in Hillsborough in September 2012. Noel, Nevin and Graham died after being overcome by slurry gas at their family farm. Six pumping appliances attended this tragic accident with the NIFRS data showing the first appliance arrived 11 minutes after the emergency call was made. A total of 120 incidents attended during 2011 and 2012 related to suicides or attempted suicides. These included people attempting to jump from bridges and roofs, people inhaling car fumes and dousing themselves in petrol, crews rescuing people from water, recovering bodies and being in attendance when a 14-year-old girl was talked down from a bridge by a counsellor. Fire crews attended 31 “bariatric incidents” which relate to obesity. Many were medical incident call outs to assist ambulance staff to move bariatric patients but fire crews also helped an obese person back into bed and assisted an undertaker to remove a deceased man from a bathroom. The fire service data also includes 260 callouts involving a child or children. These incidents include fingers trapped in a plug hole, children stuck in the bath, locked in cars, a leg stuck in railings, stuck in rooms, a two-year-old child who had to have a potty removed from their head with bolt cutters, children involved in road accidents, gas leaks, an arm stuck in pool table, a child who fell from a roof, a child rescued from a tree and children trapped in lifts. A total of 336 call outs referred to animals. A pony was removed from bogland using slings, lines and an inflatable walkway; a cat was removed from barbed wire with bolt cutters; a calf was released from drain pipe; one incident refers to “big old dog helped downstairs”; a puppy was released from cat flap; a seagull was rescued from a TV aerial; a duck was removed from a chimney by firefighters; a dog had to be rescued after becoming stuck under an oil tank; a ferret was rescued from under a fridge and 65 piglets were rescued from a shed due to flood water. A total of 74 call outs over the two year period include a reference to cats or kittens. In 25 of these cases, fire crews went to the aid of cats stuck up trees. The address with the most call outs over the two years was the Upper Newtownards Road in Dundonald – 260 of the 286 call outs were false alarms. It may be significant that this is the address for the Ulster Hospital. The second most common address showing up in the data was the Grosvenor Road in Belfast’s Lower Falls (232 call outs) – which is the address for the Royal Hospital. Of these incidents, 205 were false alarms. The third most common address was the Lisburn Road in Belfast (224 incidents) – 144 were false alarms. The NIFRS said that the majority of false alarms at hospitals were as a result of their automatic fire alarm (AFA) systems and that 98% of all AFA calls are false alarms. The most common causes are system faults, cooking fumes, contractors at work, cigarette smoke, dust and steam. The fire service developed an ‘Unwanted Fire Signals’ policy in 2007 to help premises’ owners to reduce the number of false alarms from their AFA systems. Reductions have been made but the NIFRS said further reduction is still needed. This policy includes that only one fire appliance is now mobilised to an AFA incident – before 2007 it was two. If it turns out to be an actual fire, additional resources can be requested. 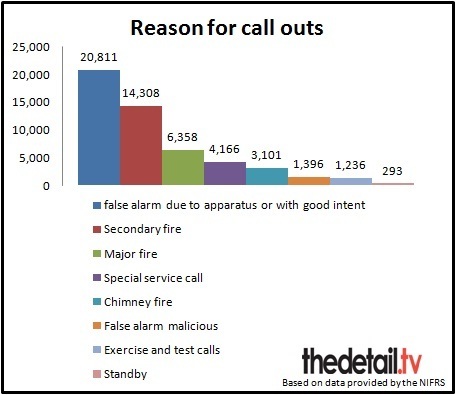 A total of 22,207 of the total call outs attended by fire crews during 2011 and 2012 were false alarms and 1,396 of these were malicious false alarms. The NIFRS said: “False alarms with good intent are cases where people have called 999 believing there to be a real fire or persons in danger. “NIFRS will always respond to emergency calls where is it believed to be a genuine call and incident. That is our job in serving our community and we are proud of our record in responding to a wide range of emergency incidents every day across Northern Ireland. “Malicious false alarm calls or hoax calls are a complete waste of NIFRS resources and mean that a fire crew is temporarily unavailable to respond should a genuine emergency arise while they are out responding to what turns out to be a malicious false alarm or hoax call. “Over the years NIFRS has worked hard with local communities and young people to drive down the number of the hoax 999 calls being made. Our statistics show that the number of hoax calls made, right across Northern Ireland, continue to fall year on year and we welcome this reduction. “Our statistics show that of these type of call received in the Regional Control Centre in 2012 we only responded to 27% of calls. “We use a range of methods to tackle this problem including community education through our youth engagement and schools programmes, advertising, public relations, social media etc. We want to educate young people especially about the gravity and dangerous nature of making false calls. Due to Data Protection, the NIFRS asked that individual addresses be omitted from any public reports so we have removed the address column from the Excel spreadsheet below this article. The original data provided to us also contained more detailed ‘free text’ on each incident than the second draft has. This included some personal details like victims’ names and ages so we have uploaded the less detailed version below. 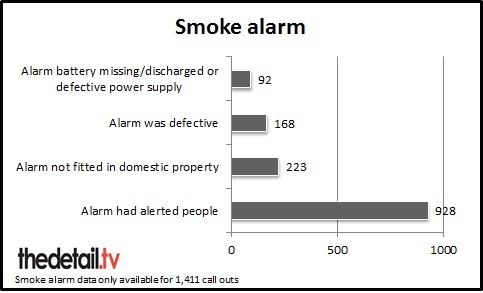 Information about smoke alarms was provided for just 1,411 of the total 51,669 incidents. Of the cases where it was noted there was no alarm or the alarm/battery was faulty, there were five deaths. The NIFRS provided more information about smoke alarms. “In our published performance criteria, the number of working smoke alarms in private dwellings (according to independent surveys) is showing as 98%. “The number of coded incidents (in the data provided to The Detail) appears to be quite small in comparison and reflects the occasions when crews attending incidents report to the Regional Control Centre verbally by radio that a smoke alarm was either present and alerted the occupants, did not operate for whatever reason or had a battery missing or discharged. “This is not always reported from the incident and as such the number appears to be low." The spokesman added that a new system of recording incident statistics was introduced last August and is still in a pilot phase. This will allow firefighters who return from incidents to note statistically whether or not smoke alarms were installed and working. A detailed statement in response to our findings was provided by Assistant Chief Fire Officer Dale Ashford. He said: “We have a statutory duty to provide an effective and efficient fire and rescue service whose resources are mobilised to emergencies in order to keep the community safe from fires, road traffic collisions and other types of dangers. “Everyday our fire fighters, men and women serving their local community, are responding to a range of emergency incidents across Northern Ireland – fires, road traffic collisions, flooding, collapsed buildings, specialist rescue situations, hazardous material incidents etc. “We provide a dedicated and professional operational response to incidents alongside our preventative community safety education work. As well as responding to 999 calls for assistance we want to protect people from getting injured in the first place. “All NIFRS personnel including fire fighters, regional control centre personnel and support staff work diligently to deliver the best possible fire and rescue service to the people of Northern Ireland. We are especially grateful to the employers of retained fire fighters who allow their staff to become retained firefighters and respond to emergencies during their normal working hours to help other people in need. To read his comment in full, click on the link below. The NIFRS is an “executive non-departmental public body” sponsored by the Department of Health Social Services and Public Safety. We asked Health Minister Edwin Poots to comment on our findings and asked specifically for this to include his opinion on the variation in response times between stations and the high cost of responding to false alarms. However, his reply did not refer specifically to the area variation in response times. Mr Poots said: “The Northern Ireland Fire And Rescue Service continues to educate and inform the public about the dangers of fire; the risks associated with hoax calls when fire fighters are diverted from genuine emergencies; the social and financial damage caused by deliberate fire setting and, with other partners, road safety awareness. “We all have a social responsibility to take these messages on board and it’s clear that they are hitting home. For example in the 2011/12 financial year the fire service handled 43,062 emergency calls from members of the public: an 11.5% overall reduction from the previous year; it responded to of 27,149 emergency incidents – an 11.8% overall reduction and the number of hoax calls reduced by 8.5% from 3,036 to 2,778. “There are, however, still a small minority of people who persist in making hoax calls and setting fires – irrespective of the social and financial cost. When a fire appliance is attending a hoax call it is not available for a genuine emergency. “While the number of fire fatalities in dwellings reduced from 11 to 10 during 2011/12: (investigations into a number of these are still ongoing to determine whether they were accidental or deliberate) this is still too many. The 10-year trend pre-2010/11 had shown a fall of 60% and fatalities had recently remained in single figures. “The fire service like everyone has to live within its means and does not have an inexhaustible budget. It must, therefore, plan how it allocates its resources and describe the type of service it expects to deliver. “This is done through integrated risk planning which allows it to have the right people and equipment in the right place to protect local communities.